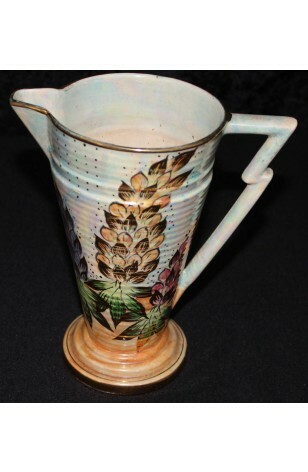 Antique - Kensington Ware, PKB Burslem - Art Deco, Lustreware, "Rhododendron" Pattern, Hand Painted, Circa 1930's. Absolutely Beautiful Art Deco Hand Painted Lustreware, 9" Tall Pitcher, made by Kensington Ware - PKB Burslem. This Piece is Brightly Colored in Pink, Yellow, and Blue Rhododendron Blossoms that are Highly Enhanced with Gold, Bright Green Foliage, Blue Lustre Background, and a Lightening Bolt Styled Handle. Pitcher has a Triple Ringed Foot, and the Lower Ring is in Orange Lustre, No Chips or Cracks. Some slight age crazing... A really nice Piece.